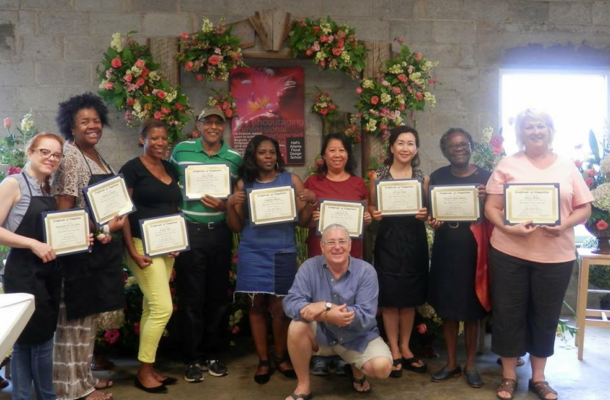 HAFDS Certificate Programs - Halls Atlanta Wholesale Florist Inc.
Programs are a series of 6 Single-Day classes that teach specific skill sets chosen specifically for that certificate. We offer two: The Journeyman Program (a well rounded set that includes sympathy design, corporate design, social design, and business management), and The Wedding Program (a complete set of social design classes that include all of the personal flower designs, ceremony designs, reception designs, and a business management class). The Journeyman Certificate consists of six (6) Single-Day classes spread out over the year. There are duplicates of most classes in this curriculum in order to facilitate different student schedule needs. The Wedding Certificate consists of six (6) Single-Day classes spread out over the year. There are duplicates of most classes in this curriculum in order to facilitate different student schedule needs. The net result is greater availability, and the ability to tailor our schedule to yours. In order to achieve either the Wedding Certificate* or the Journeyman Certificate*, you MUST complete the six (6) chosen classes for that curriculum. Bookings for the Certificate level classes will be on a “Lump sum” basis, meaning that each student must book their classes in advance, at the time of registration. Multiple dates of most Certificate level classes are available to facilitate concentrating or spreading out classes as needed. Please consult the schedule to choose your class path. Check the Schedule for the classes that best suit her availability. Select the class dates she would prefer. Use our simple Registration Page to select her Program, and the dates of the classes she wants. Call Halls to pay her retainer for the set classes. Complete her six (6) required classes. Once selected and retained, Macy MUST attend all of her classes to receive her Certificate. *Certificates are certificates of completion. HAFDS is a for-profit school of floral design and is not in any way sponsored, governed, controlled by, or associated with any University System, State Government, or Federal Education Program. Our excellent reputation has been proven by our continuing success (10 years now!) and thousands of satisfied students. Our primary focus is to provide a thorough education in floral design, and improve the skill sets of both new and practiced designers. *** A personal note about Certificates and Certification: Since we have been in operation, many students have called to inquire about “Certification”. Hopefully this will help clear up any lingering questions. The State of Georgia does not offer any State Sponsored Certification in the field of Floral Design. They consider it both an “art” and a “trade”. There are at this point no governing bodies that regulate curriculum, set curriculum, or establish “standards” in our field. In the contiguous United States, there are only seven states that do offer any form of certification. Normally it is offered as a minor or certificate attached to a four year horticultural degree. Mississippi is the only state to offer Floral Shop Management, and that is coupled with a four year horticultural degree. Since starting the school ten years ago, I’ve lobbied to have the State add our field to their Certification programs, but as yet have had no success. In my 30 years in Floral Design and the Special Event Industry, I’ve yet to have anyone ask for my certification. Generally, potential employers and clients want to see what you know, and what you can do. My personal advice is to learn how to do it, and build your business.